Fat Bruce Lee (sort of on half-assed diet), ChiBurger, myself, plus one found ourselves working on a Saturday. MIRU 8691, a self-proclaimed Korean Burger and Fish Bar, was not far from our opulent offices. We piled into Fat Bruce Lee's luxury supercar and located the strip mall where the restaurant was located to check out their cheeseburger skills. MIRU 8691 was modern and clean--the staff was very polite. Trivia that I picked up...Miru is the name of the the chef--8691 is the year of his wife's birth in reverse. The lunch special Miru Burger Kalbi--Kobe beef--was about 12 bucks, and that came with soup, two amuse-bouche selections, fries, and a choice of kalbi beef ribs or tuna as a burger topping. I was pleasantly surprised to learn that they had cheese for the burgers, since there was no mention of it elsewhere on the menu. The Beef: The Kobe beef was a medium grind of Chuck, and it was very subtle in flavor. There was no trace of aging, still the beef was flavorful enough that it was hard to put the burger down. Ordinarily, it would have been a waste to use Kobe beef in a burger. The magic of Kobe is in the texture and mild flavors, but in this case the other flavors were delicate enough to allow the beef to shine. It was probably an 80:20 blend, and it managed to be juicy without being greasy. The Sear: Yep, MIRU 8691 got a really nice sear on the thick patty. They managed to do that over a VERY hot grill--points for that. The sear lent crunch and chewiness to a bite that would have otherwise been uninteresting--ground Kobe beef tends to be mushy when not handled properly. The Seasoning: They applied a light dusting of a Korean seasoning blend to the exterior, and they left the interior alone. Ordinarily, this would have been dull, but it worked in this case. 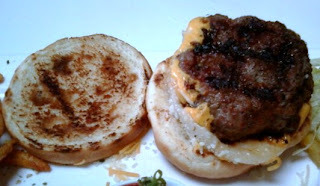 Again, the Kobe patty needed tender care to avoid getting lost in the dish. The Preparation: The cheeseburgers took at least 20 minutes to show up at our table. When they did arrive, the amount of time that it took was clearly justified. MIRU 8691 were artful in their presentation and preparation of their cheeseburgers. The 6-7 ounce burgers came out a perfect Medium. The fact that they grilled rather than griddled the burgers was a blessing--none of the carmelized sugars from the sweet galbi dishes were transferred to the burgers. This was one of the things that ruined the burgers at Kalbi Burger for me. 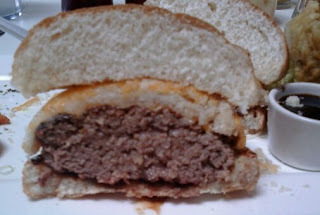 The thick patties were formed with gentle pressure, so there was zero chewiness. The bite was tender and yielding. The Cheese: They used a sliced American and a shredded Cheddar blend and applied all of that to create thick layer of molten goodness. It worked. The thick, gooey, melted cheese added just the right amount of salt and umami to the dish. Again--ordinarily, a mild Cheddar would have been a bystander, but in the case of MIRU 8691, the mildness paid off. The pictures show the perfection with which the cheese was applied and melted. The Bun: What bun? The bun was a delicate, tender, mild spectator in this dish. Its sole purpose was to deliver cheese and beef to the mouth with a minimum of inconvenience. They toasted the bun--it held up to the juiciness of the burger without being noticed in the bite. 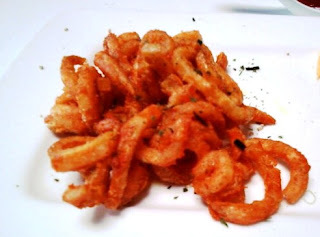 The Fries: These were seasoned, spiral-cut, battered, crispy, golden-brown coils of deliciousness. They were accompanied by a spicy ketchup that was better than expected. The fries were a winner, and the spice in the ketchup really rounded them out. The Sides: The galbi beef rib meat was nice...it would have been awful as a topping on the burger, because it would have ruined the texture. The rib meat also came with a sweet sauce. That sauce would have also overwhelmed the dish. It was nice to have some beef after polishing off my burger. Also, the grilled pineapple was terrific, and I will admit to trying it with a few bites at the end of the burger--it worked. Finally, they provided an crunchy, tempura, onion ring made with sweet, red onion. The Value: The value was stellar. We all walked away stuffed and completely satisfied. I would have gladly paid more for this burger and its array of sides. MIRU 8691 rocked the Kobe beef in the form of a burger. They did it by truly respecting the beef and playing to its gentle, nuanced flavor. The preparation and the presentation were both precise--a great deal of culinary talent was brought to bear to deliver this sort of dish. Keep in mind that they had designed a very different burger with clashing textures and flavors, both of which would have hidden the strengths of the burger meat. 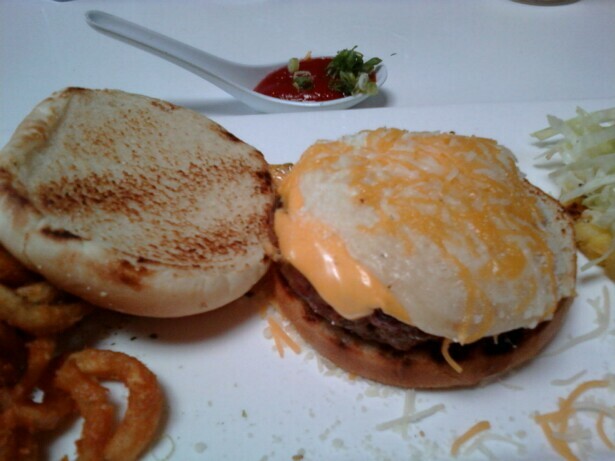 To truly experience a purist cheeseburger at MIRU 8691, one must order EVERYTHING on the side except for the cheese. Burger Review : This was about as good as Chuck could get. 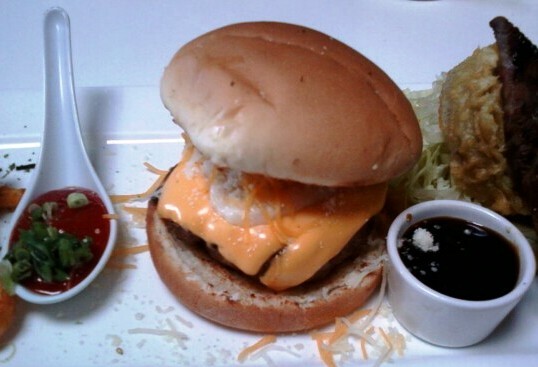 MIRU 8691 delivered a spot on interpretation of the cheeseburger with great precision and a little improvisation. Also, a damn good price for Kobe beef. Editor's Note: We returned on 25MAR11, and the burger earned a 5 Bites rating. See most recent review here.